Figure 1. 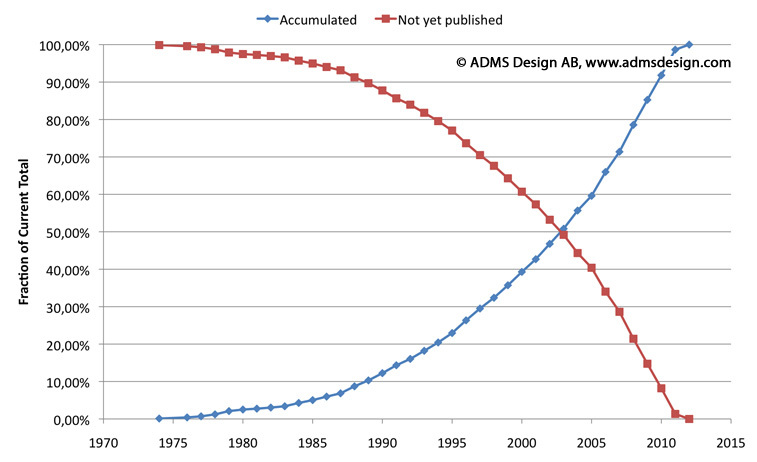 Accumulated publication count for scientifically reported ADC implementations in mainstream IEEE sources. The number of publications equivalent to 20% of total is indicated for reference. When is it a “survey”? — I’m not going to spend too much energy on a stringent definition of a “survey”. My guideline is that a survey should be based on a significant amount of data, and that the visualization, discussion and interpretation of the data is the main work. Many scientific papers nowadays include a scatter plot that compares a particular design with 5–20 relevant prior efforts. While it’s a good idea to do so, these papers are not considered surveys in this context. Others use large amounts of empirical data to validate or derive a model, but the focus is more on the model. What is “a significant amount of data”? — The size of the survey should be related to the total amount of data available at the time of the survey. A survey of 200 papers would have been exhaustive in 1990. Today it represents less than 12% of all scientific publications. The accumulated amount of scientific papers over time is shown in Fig. 1. While this is not the absolute total number of ADC publications, it covers the ADC implementations reported in nearly all journals and conferences central to the A/D-converter field, and shall for simplicity be referred to as the “total” amount here. The number of sources equivalent to 20% of the accumulated total at any given time is also shown in Fig. 1. So, how much of the total do I need? Well, it depends on what you’re trying to do. When it comes to survey data, I’m a firm believer in “the more the merrier”, but there are tasks which can be done with a fairly small subset. For example, if you want to get an idea of the overall trend for one parameter vs. another or just make a quick sanity check. Small subsets do have some limitations though. For the subset to function as a reasonably generic approximation of the exhaustive set, its data must span roughly the same chunk of parameter space, and have similar distribution of values in all dimensions. This is difficult to achieve unless you make a random sampling of the exhaustive set. A smaller set also risks running out of data, for example when dividing it further according to some parameter such as resolution or architecture. How quickly will a survey become dated? — I really don’t know. I guess it depends on what you wish to study. But we can observe, as in Fig. 2, how the accumulated total at any given time relates to the overall total (here 1708 papers), and what percentage of currently available works were yet unpublished at any given time (e.g., at the end year of a particular survey). It is seen that approximately 50% of all currently available papers (~Q1-2012) were published in the last 8–8.5 years, i.e., after 2003, and almost 30% were not yet published in 2007. By the end of 1997, 70% of today’s body of empirical data was still unpublished. You can use Fig. 2 to assess how old a survey can be before it’s no longer useful for your purpose. Can you make business decisions based on trend estimates where the most recent half of the data set is missing? Probably not. Most recent 30/20/10%? If so, you need a survey that’s less than approximately 4/3/1 years old. It is clear that continuously updated surveys, such as Murmann’s, or the one used here at Converter Passion are preferable over single-shot attempts, since the former allows for continuously updated trend estimations. Figure 2. Paper “yield”. The fraction of current total already published (blue) and yet to be published (red) at the end of any given year. The “mother of all ADC surveys”, and the most frequently cited of all, is the pioneering work by Walden  where 150 scientific and commercial ADCs were analyzed, and performance trends were extracted. An earlier version was published already in 1994 , but this extended work became “The Walden Survey” to most of us. Although the 150 source documents originated from a mix of commercial and experimental designs, the Walden survey had a size equivalent to 30% of all scientific publications available at the time. The methods introduced in  are still useful, but Fig. 1 and Fig. 2 suggest that the trends extracted in  are unlikely to be valid and applicable today. At least they would have to be confirmed using more recent data. Two updated versions of the survey were published in 2008 – one covering 175 ADCs and data until 2007 , and one with an unspecified survey size and data until 2008 . It is unclear how the 175 converters included in  were selected. During the time from Walden’s classic survey to 2007, the academic output alone generated another 715 new sources – commercial parts not counted. The +25 increase in source data therefore seems surprisingly incremental. Still, some of the results in  align very well with Converter Passion data, so apparently it was a carefully chosen subset. Merkel and Wilson surveyed 150 commercial and scientific ADCs with specifications suitable for defense space applications . Their data appear to span from 1993–2002, and the selection criteria for inclusion in the survey was a sampling rate fs ≥ 1 MS/s, and nominal resolution N ≥ 12 bits. The paper does not reveal the mix between scientific papers and commercial parts, but gathering 150 sources must have been quite an effort by the authors. The total scientific output matching these specs and the time period is no more than 81 papers, and only 59 in the two sources (ISSCC, JSSC) the authors mention as primary. An additional minimum of 69–91 commercial parts must have been included to reach 150 sources. It is therefore assumed that the Merkel & Wilson data set was close to exhaustive for the spec range surveyed, and exhaustive data sets are always applauded here at Converter Passion. The analysis and discussion itself is geared towards the stated application and focused on linearity (SFDR) to the extent that noise parameters are not treated at all. Power dissipation, supply voltage, speed, device type, scaling and architecture were observed. 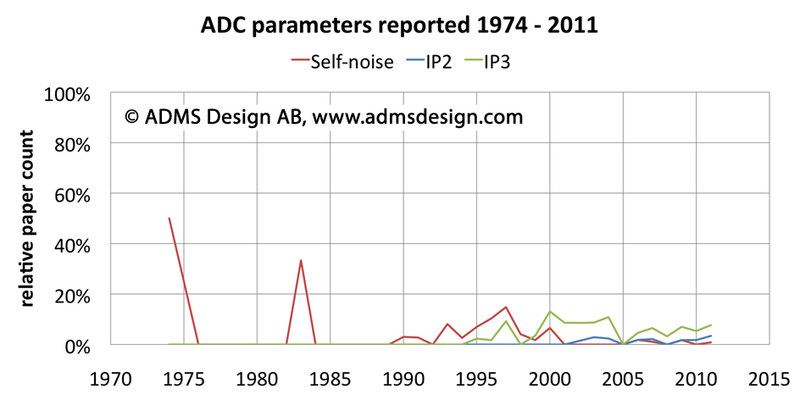 An enormous data set, covering nearly 1000 commercial ADC parts from 1983–2004 was used in the survey by Le, Rondeau, Reed and Bostian . As a comparison, the scientific output from the same years (not included in their survey) is 900 papers. The work is firmly rooted in the Walden tradition, but also considers parameters such as the number of channels per package and cost vs. performance. Additionally, the treatment separates the data by architecture, which adds an interesting extra dimension. Because of the larger volume and time span of the data set, part of the focus is to establish differences between this work and the classic Walden paper. Unfortunately, some exponentially improving parameters were plotted along linear axes, which makes many results from the survey difficult to see or interpret. Nevertheless, the contribution by Le et al. is a gigantic work and a key reference. The survey by Murmann  is a significant recent contribution to the analysis of empirical performance data. It covers approximately 260 scientific ADCs reported 1997–2008 at the two conferences VLSI Circuit Symposium and ISSCC. The work analyzes ADC performance trends with a focus on energy per sample and signal-to-noise-and-distortion ratio (SNDR). The impact of process and voltage scaling is considered. If you don’t have this paper already, you should definitely head over to IEEE Xplore and get it right now. Murmann’s survey has further benefits in that it is continuously updated and the data set is available online . The latter opens up a lot of possibilities for anyone wishing to analyze the data in their own way, and makes the survey a very important contribution to the field. It currently includes around 350 sources. A rather different angle is taken in , where Fuiano, Cagnazzo and Carbone use survey data to analyze the correlation between scientific literature and patent activity. Compared to more “Waldenesque” surveys, this is a rather different animal. It nevertheless appeals to me as it illustrates an attempt to mine large amounts of survey data for something more unusual than ENOB, fs and FOM. ADC trends and performance evolution over time was analyzed in . The impact of CMOS scaling on ADC performance was empirically analyzed in . ADC architectures were compared with respect to energy efficiency in . Area-efficiency of ADC architectures was surveyed in . The largest survey for which this data set has been used so far is the recently published series of posts on A/D-converter performance evolution . Vogels and Gielen used a multidimensional regression fit to derive an ADC power dissipation model/FOM based on ≥ 70 empirical data points divided by architecture . A similar approach was recently used by Verhelst and Murmann to analyze power dissipation and area vs. scaling based on Murmann’s data set  . Sundström, Murmann, and Svensson derived theoretical power dissipation bounds in , and used the Murmann set to compare theory with empirical reality. In , it was illustrated how the quality of a figure-of-merit (FOM) can be assessed by testing it against a large set of empirical data. If you feel that I’ve left out any contributions that could have been mentioned in this post, just add a comment below. B. E. Jonsson, “A survey of A/D-converter performance evolution,” Proc. of IEEE Int. Conf. Electronics Circ. Syst. (ICECS), Athens, Greece, pp. 768–771, Dec., 2010. F. Fuiano, L. Cagnazzo, and P. Carbone, “Data Converters: an Empirical Research on the Correlation between Scientific Literature and Patenting Activity,” Proc. of 2011 IMEKO IWADC & IEEE ADC Forum, Orvieto, Italy, pp. 1–6, June, 2011. B. E. Jonsson, “An empirical approach to finding energy efficient ADC architectures,” Proc. of 2011 IMEKO IWADC & IEEE ADC Forum, Orvieto, Italy, pp. 1–6, June 2011. B. E. Jonsson, “Area Efficiency of ADC Architectures,” Proc. of Eur. Conf. Circuit Theory and Design (ECCTD), Linköping, Sweden, pp. 560–563, Aug., 2011. 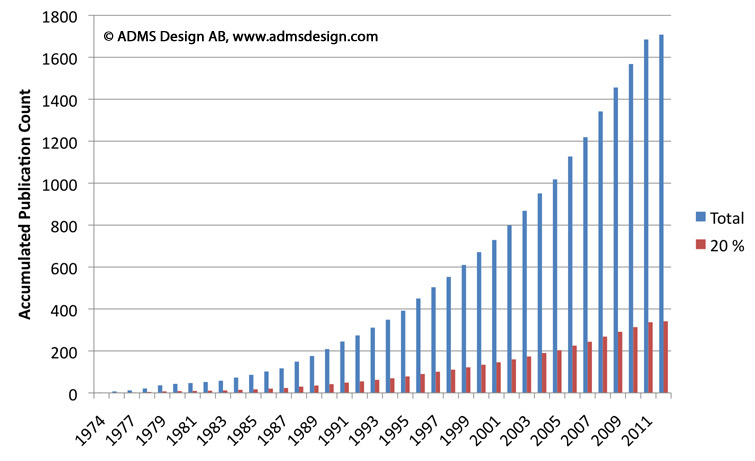 B. Murmann, “ADC Performance Survey 1997-2012,” [Online]. Available: http://www.stanford.edu/~murmann/adcsurvey.html. B. E. Jonsson, “A/D-converter Performance Evolution,” Converter Passion, Aug., 2012, Available: https://converterpassion.wordpress.com/articles/ad-converter-performance-evolution/. M. Vogels, and G. Gielen, “Architectural Selection of A/D Converters,” Proc. of Des. Aut. Conf. (DAC), Anaheim, California, USA, pp. 974–977, June, 2003. M. Verhelst, and B. Murmann, “Area scaling analysis of CMOS ADCs,” El. Letters, Vol. 48, No. 6, pp. 315–315, Mar., 2012, IEE. B. E. Jonsson, “Using Figures-of-Merit to Evaluate Measured A/D-Converter Performance,” Proc. of 2011 IMEKO IWADC & IEEE ADC Forum, Orvieto, Italy, pp. 1–6, June 2011. Figure 1. Fraction of papers reporting a specific parameter. Working with the ADC survey, I had noticed that the set of measured performance parameters authors choose to report or omit changed over time. I’ve gathered the statistics, and it will be interesting to hear what you think of it. Figure 1 shows the percentage of papers reporting signal-to-noise-and-distortion ratio (SNDR), signal-to-noise ratio (SNR), spurious-free dynamic range (SFDR) and total harmonic distortion (THD) each year. The good news is that dynamic single-tone performance is more frequently reported in today’s papers than ever before. In fact, SNDR was reported in 96% of all papers from 2011. Both SNDR and SFDR show noisy but steadily increasing trends, and SFDR is now reported in around 68% of all papers (2011). At the same time, SNR is increasingly being abandoned in favor of simply reporting SNDR instead. We can also see that THD is becoming an endangered parameter. SNR and THD have been in a visible decline after year 2000, and THD was only reported in 12% of the papers in 2011. SNR went from 60% in year 2000 to 41% 2011. These numbers trouble me. If the trend continues, we will know less about the noise in our A/D-converters for each year. I can’t possibly see how that can be of benefit to “Science” or to the reader. If you can, be sure to post a comment below. Figure 2. Fraction of papers reporting specific combinations of parameters. Above we looked at the reporting frequency for each individual parameter. Authors also choose which simultaneous combination or set of performance parameters they include in a paper. This is shown in Fig. 2. Many works report SNDR together with SFDR, and 67% of all papers from 2011 reported at least these two parameters. There is a strong positive trend, so within a decade we may see SNDR+SFDR reported in nearly all published papers. The second most popular parameter pair is SNDR+SNR, with 38% coverage in 2011. Unfortunately, its reporting frequency is limited by the negative trend for SNR. A more complete single-tone characterization is achieved with the three-parameter combination SNDR+SNR+SFDR. Only 21% of all papers published in 2011 offer this much information about the circuit. Even if there is currently a positive trend, it might soon become limited by the decline in SNR reporting, and eventually reverse. The practice to report a full four-parameter set is very unusual – only 9% of the papers did that in 2011. It has actually never been really common, and if THD continues to disappear from papers, the four-parameter performance will be increasingly rare. Lots of credit to authors that are still reporting a full set! It is much appreciated here at Converter Passion. Finally, a few other rare species in the ADC parameter ecosystem are shown in Fig. 3. While the highly valuable parameter self-noise appears to be on its way to extinction, intermodulation distortion (IMD) as represented by the second– and third-order intercept point (IP2, IP3) seems to cling to life in the outskirts of the habitat. So … what do you make of all this? Do you think it will have any long-term impact on our field of science? Does it matter to you what parameters are reported or not? Have your say in the comments below. Figure 3. Endangered species in the parameter ecosystem. Poll result: What parameters should be mandatory in ADC papers? Poll: What ADC parameters should be mandatory in ADC implementation papers? Back in July 2011, I raised the question “What parameters should be reported in a good ADC paper?”, and I also asked you what parameters you felt should be mandatory to report in ADC implementation type of papers, when applicable. The poll has been simmering for a while now, and your verdict as of May 28, 2012 is shown above. Sampling rate (or bandwidth) is the parameter that most of the voters felt should be mandatory to report, closely followed by signal-to-noise-and-distortion ratio (SNDR). I kind of expected these two to come out on top. The lowest ranking parameters in this poll are effective resolution bandwidth (ERBW), self-noise, and intermodulation distortion (IMD). There are some results that surprised me: I didn’t expect to see the low interest in nominal ADC resolution (N) and power dissipation (P). Only half of the voters want to require authors to report power dissipation, and as little as one third (!) wish to enforce the reporting of nominal resolution when applicable. Interesting, indeed. What do you say? Are these results expected? Does the ranking list match your personal parameter preferences as well? Are your top two parameters also fs and SNDR (ENOB)? I’ll keep the poll active, so if you want to have a say too, just make your choices below. PUBLICATION TRENDS: Now, with all the new survey data, I’m planning to do a series of posts on A/D-converter performance evolution and research trends. First out is an update of the overall number-of-publications trend, which was originally discussed in one of the first post on the blog. If the scientific output volume follows the current trend, it projects to 225 ADC papers per year by 2020 and 433 papers in year 2030. That’s a lot of papers! Probably we’ll see a slow-down in publication volume before that, but only the future can tell us when, and to what level it will saturate. It is possible that we’re already observing a saturation towards ~120 papers/year. The paper count has not increased since 2008. On the other hand, the historical curve is not monotonic, so it could just as well be noise in the data. 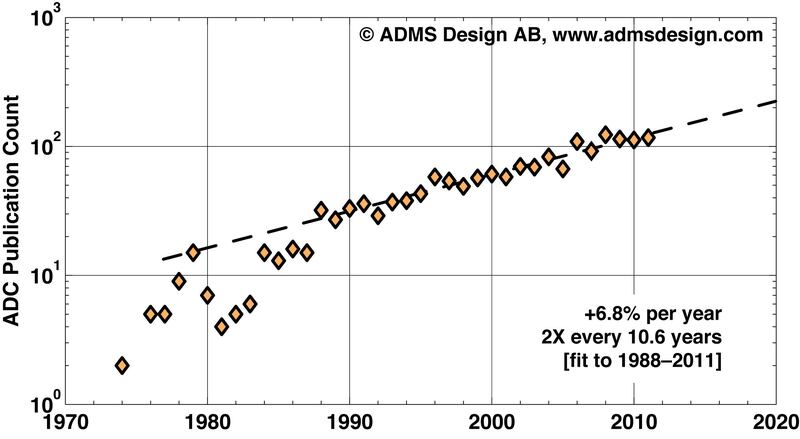 A similar four-year plateau is for example observed 1996-1999, without changing the overall trend. What do you think? Are we observing a saturation of the scientific ADC output volume? Would that be good or bad? Is there a limit for how many papers the ADC community can handle per year? Share your thoughts or answer the polls. 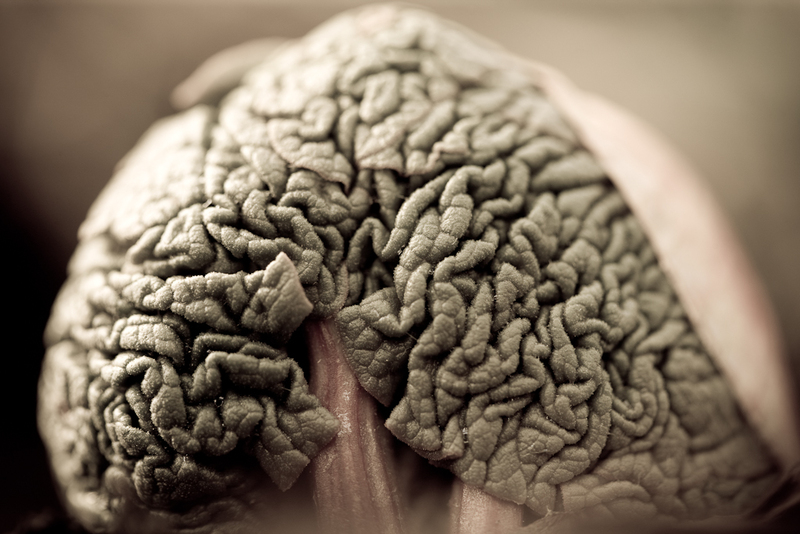 Will reading tons of ADC papers grow your brain — or wear it out? Well folks, its the time of year when an A/D-converter survey update is due. Since a significant effort is still invested in the quest for ever-improving figures-of-merit (FOM), I’ll start by firing up the Converter Passion FOM-o-meter and apply it to the body of ADC science. The latter is here approximated by my pet project – the ADC performance survey. Including the papers added since last year, the updated survey now has 3628 experimental data points extracted from 1708 scientific papers published between 1974 and April/May 2012. The number of unique ADC implementations will be slightly less, since some papers are full-length versions of conference contributions. The source publications monitored are listed here. the state-of-the-art (4.4 fJ) reported by van Elzakker et al. at ISSCC four years ago  is still number one. Their design really went the extra mile with respect to getting a low energy per sample, and I guess that paid off big time. Well done! The most striking feature is probably that they are all SAR ADCs. Secondly, while they are all impressive efforts, the one that stands out a bit is the design by Verbruggen et al. It maintains a sub-10fJ FOM at a significantly higher sampling rate (250 MS/s) while also reporting the highest resolution . Although it’s beyond the scope of this post, it can be good to keep in mind that there are other aspects to factor in than simply the FOM value when analyzing energy efficiency. It was pointed out by Verbruggen  that previous ultra-low FOM ADCs have been reported only at rather low sampling rates or moderate resolution. It is a greater challenge to maintain a low for high sampling rates. Hence, pragmatic limits to the state-of-the-art are speed-dependent. It has also been shown that the limits are both scaling- and resolution-dependent [7, 8], so a perfectly fair comparison between designs is difficult to make. I can pretty much guarantee that I’ll get back to this topic in the future, but for the remainder of this post we’ll just look at the raw FOM numbers as they are. has been improved by over a factor of two through the switched-opamp (SO) based ∆∑ design reported by Xu et al. . Previous state-of-the-art – 2.7aJ reported by Perez et al. – will assume its well-earned place in the Hall of Fame, while we applaud the 1.1 aJ achieved by the Chinese team from Zheijan University and Analog Devices, Shanghai. You’re the best now. Enjoy! There has also been some evolution among the Nyquist ADCs: The 250MS/s SAR ADC by Verbruggen et al. mentioned above, is actually the new Thermal-FOM champion for Nyquist ADCs as it nudges the previous record  from 7.6 to 6.6 aJ. The authors are with imec, Belgium, and Renesas Electronics, Japan. Congratulations! Old and new winners are always found in the halls of fame for Thermal and Walden FOM, respectively. If you are only interested in checking for the current leaders, the FOM-o-meter gives you both with a single click. As always: I do believe the information here is correct, but if I’ve misrepresented anyone or forgotten to mention someone that should have been included, just send me an email or post a comment below. R. Sekimoto, A. Shikata, T. Kuroda, and H. Ishikuro, “A 40nm 50S/s – 8MS/s Ultra Low Voltage SAR ADC with Timing Optimized Asynchronous Clock Generator,” Proc. of Eur. Solid-State Circ. Conf. (ESSCIRC), Helsinki, Finland, pp. 471–474, Sept., 2011. T.-C. Lu, L.-D. Van, C.-S. Lin, C.-M. Huang, “A 0.5V 1KS/s 2.5nW 8.52-ENOB 6.8fJ/Conversion-Step SAR ADC for Biomedical Applications,” Proc. of IEEE Custom Integrated Circ. Conf. (CICC), San Jose, California, USA, pp. 1–4, Sept., 2011. P. Harpe, Y. Zhang, G. Dolmans, K. Philips, and H. De Groot, “A 7-to-10b 0-to-4MS/s Flexible SAR ADC with 6.5-to-16fJ/conversion-step,” Proc. of IEEE Solid-State Circ. Conf. (ISSCC), San Francisco, California, pp. 472–473, Feb., 2012. A. Shikata, R. Sekimoto, T. Kuroda, and H. Ishikuro, “A 0.5 V 1.1 MS/sec 6.3 fJ/Conversion-Step SAR-ADC With Tri-Level Comparator in 40 nm CMOS,” IEEE J. Solid-State Circuits, Vol. 47, pp. 1022–1030, Apr., 2012. B. Verbruggen, M. Iriguchi, and J. Craninckx, “A 1.7mW 11b 250MS/s 2× Interleaved Fully Dynamic Pipelined SAR ADC in 40nm Digital CMOS,” Proc. of IEEE Solid-State Circ. Conf. (ISSCC), San Francisco, California, pp. 466–467, Feb., 2012. A. P. Perez, E. Bonizzoni, and F. Maloberti, “A 84dB SNDR 100kHz Bandwidth Low-Power Single Op-Amp Third-Order ΔΣ Modulator Consuming 140μW,” Proc. of IEEE Solid-State Circ. Conf. (ISSCC), San Francisco, USA, pp. 478-480, Feb., 2011.